The Artist Chef: I won the Jamie Oliver video Contest! 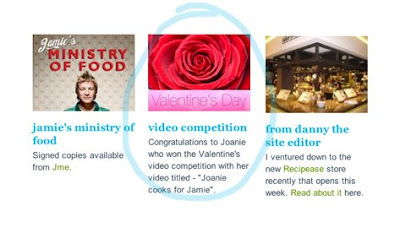 I won the Jamie Oliver video Contest! To my family, friends, officemates, Artist Chef fans, Thank you so much for all your support in rating my video for the Jamie Oliver Valentine's video contest. I think I made most of them now a registered youtube users just to vote for my video. I am very touched. I thought I wouldn't make it but your immediate response and support helped me made it. I do believe dreams do happen and they existed for us to make it real. Thank you also to Angelo Suarez for helping me out with the beautiful supers. I have to tag him for that. Again cheers to more blessings in life! Let me be the first one to say Congratulations and you deserve it! congratulations! is that you in the presto commercial? Thanks RJ and for your vote! Congratulations!!! With patience and perseverance I know you can make all your dreams come true. Godspeed and God bless.